The hideous alligator stands for respect, fear, magic, instinct, shrewdness, strength, agility, creation, dependence, efficiency, emotion, courage, secretiveness, and indestructibility. As a spirit animal, it shows you the way to protect and care for your loved ones, maintaining an aggressive attitude. To have an alligator as a totem guide means that you waste no time in seizing the right opportunity. No doubt, this preparedness makes you a punctual person with immense mental clarity. Making wise decisions in time is a cup of tea for you. For this reason, you are always on the right path towards your goals. Although the external conditions may at times are not suitable, you adjust easily in a harmonious manner without showing an inkling of irritability. Rigid and vulnerable, you can be tough at times but melt in the next instance. Also, you can effortlessly hold control of a situation if it’s going from good to worse with fluidity. Your fearlessness makes you a true fighter for coping with challenges. 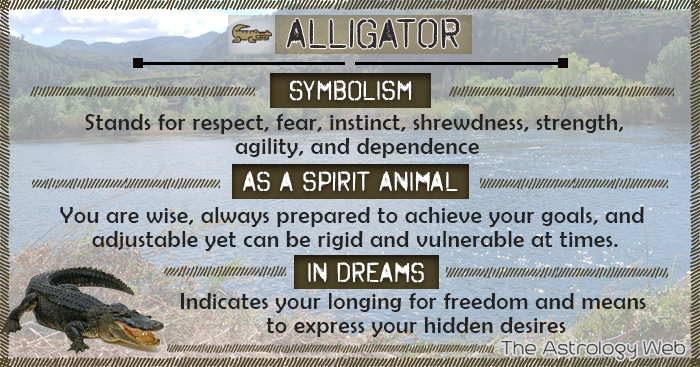 Dreams about alligators may mean that you are longing for freedom and a medium to express your hidden desires. An alligator attack in a dream represents your two-faced behavior offending many around you. If it chases you, it means that you have to be a bit more careful. On the other hand, you chasing an alligator may symbolize a grand success. An alligator biting you means that you have an urge to show the world your hidden strength. Seeing an alligator in your house warns you about an unpleasant event taking place soon. If you spot it in your bedroom, you will be experiencing trials and tribulations soon in your life. However, an alligator on or under your bed represents an issue that you are not interested in doing. Getting bitten by an alligator in a dream symbolizes that someone is insincere with you. Killing an alligator implies that you are agitated and uncomfortable in your waking life. Eating an alligator promises a future full of excitement and new adventures. A dream where you are taming an alligator signifies attainment of power and influence in waking state. Fighting or wrestling with an alligator indicates that you are trying to overcome your fears. Riding on a crocodile in a dream stands for optimism and bravery. Petting an alligator may mean that you are hitting the right road towards success and fame. An alligator swimming in a pond, pool, or any water body foretells the beginning of a new phase of life. Finding a group of alligators infesting a swamp might drop a hint at your hazy thoughts and unconstructive thinking. A flying alligator suggests that you need to concentrate on your day to day expenditure. A sleeping alligator justifies your spiritual connection with your subconscious thoughts. A friendly alligator talking to you in your dream suggests that some known people are gossiping about you. A giant alligator refers to your opponent with whom you are having a cold war. To dream of a calm alligator is a way of telling you to be calm and strategic to go about with your daily routine life. If you see an alligator eating someone such as a dog or baby in your dream, it could point towards a particular problem that’s making you feel suffocated from inside. Dreams with alligators and snakes throw light on your overprotective nature. A baby or small alligator indicates that the hurdles you are encountering are passable. A dream about alligators while pregnant could highlight your intuitions. An alligator hatching eggs in your dream denotes that your friends may seek your help and advice. The skin of an alligator means that you are insensitive and unsusceptible. The head of an alligator symbolizes negatives vibes that you are getting right now. The eyes of an alligator show your visual awareness. In Christianity, having recurring dreams about crocodiles represents a demonic and violent attack from someone close. A black alligator is a symbol of deceit, betrayal, and evil intentions. A green alligator showing up in your dream gives an idea about your false ego and prestige. A white/ albino alligator is a sign of forgiveness, kindness, and redemption. A purple alligator foretells happy social affairs. To dream of a red alligator might mean that your greed and avarice threaten you. A yellow alligator symbolizes illness and physical pain. The alligator was revered by many Native American tribes and has been related to Hoodoo that refers to the worship of water spirits in the South. Its foot is a powerful guard for gamblers that draws good luck as well as protects wealth. According to some biblical interpretations, an alligator is believed to be a victim of sin, vanity, and arrogance.